Teeth whitening is the most basic and widely sought after cosmetic procedure in dentistry today. Whitening your teeth helps to brighten your smile and give you more confidence. We use various procedures and products for teeth whitening in the office and at home. Composite bonding is another way of getting your pearly whites and restore broken or chipped teeth. This simple procedure takes only a couple of minutes. The dentist will drill the tooth to create a smooth even surface and then a tooth colored composite resin will be bonded over the surface of the tooth and shaped similar to the other teeth. Porcelain and composite veneers are the perfect way for a smile makeover if you have substantial damage to your tooth enamel. We use veneers to mask a wide variety of dental imperfections. Porcelain crowns and bridgework are what we use of heavily damaged and missing teeth. We create porcelain crowns and bridgework to look as natural looking as possible and fit into the natural tooth structure better than veneers. We also replace missing teeth using bridgework by using a false tooth attached to two crowns on either side which bond to the adjacent teeth. Dental implants made of titanium are great for replacing the roots of missing teeth. The dentist embeds the dental implant into the jaw and gum and fits a new crown on top of the implant to recreate an entire tooth. Tooth contouring and reshaping can also correct congenital dental defects and dental defects that develop over time. 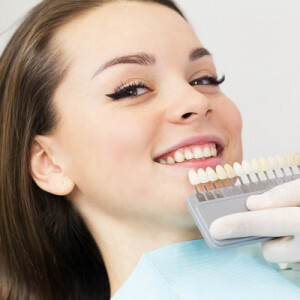 We have a variety of methods for tooth contouring and tooth reshaping to recreate the ideal smile. Many people today do not like traditional braces since they are bulky and very noticeable. We also have clear orthodontic aligners instead of metallic braces to straighten and align the teeth. We mold clear orthodontic aligners to the shape of your teeth and gum so brace fits comfortably and changes the alignment of your teeth with time. Tooth fillings, in-lays and on-lays are what we use to restore damaged molars. In-lays are porcelain or composite material fillings used in the inside of the tooth while the on-lays are attached to the biting surface. Tooth fillings do not have to be obvious and unsightly; we can create tooth fillings that are barely noticeable and match the color of your teeth closely.